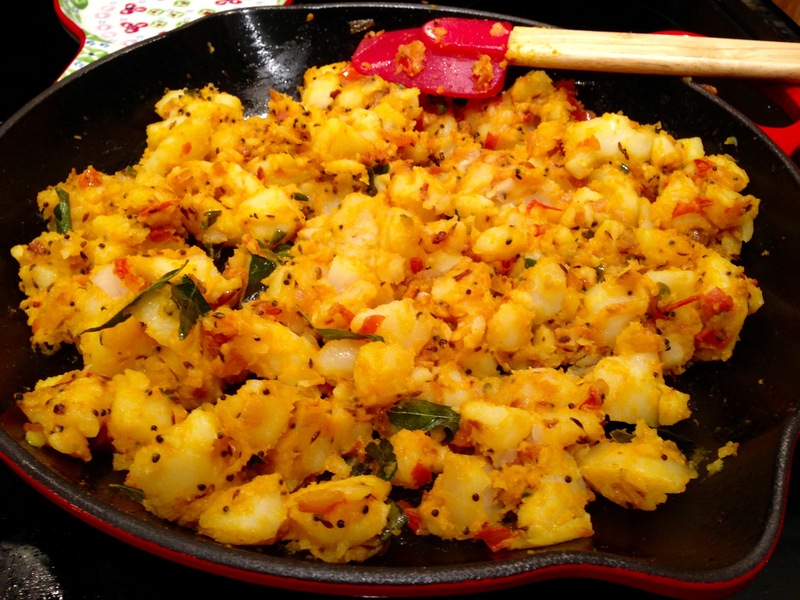 Aloo Sabzi For Dosas and Such – One Half Indian. Life has been full of surprises these last few months. My husband found work for a software company in Durham, and I could not be more excited! We have moved to a new apartment in Durham, which was a huge undertaking these past few weeks; I think the moving is finally finished now. I have been applying for jobs and have received offers from three different schools! I accepted a position at an online teaching school where I will teach middle school English. I feel incredibly blessed and grateful to have so many great opportunities for my family at this time. It has been a long winter and spring of unknowns. My mother and father-inlaw are here from India right now, and I am having a wonderful time with my Ma learning lots of Indian cooking and tips in the kitchen. Ma taught me to make this aloo sabzi for inside dosas or on a sandwich. It could even be served with rice. It’s quick and easy and very flavorful. It keeps well in the fridge, so I made a large batch to have around for fast lunches and snacks. 1. Cook the potatoes. I peeled and cut the potatoes in half and cooked in the pressure cooker with some water and salt for one whistle. Remove potatoes when done and let cool. In a bowl, use your fingers to break the potatoes apart into small pieces. 2. Heat a heavy bottom pan on medium heat. Add oil. When the oil is hot, add cumin and mustard seeds. Cover the pan and let these pop (about 30 seconds). Add in chilies and curry leaves. Let cook for one minute. Add in onion and cook all together until the onion begins to brown on the edges. 3. Add tomato to pan. Stir all ingredients together and then cover and let cook for 5-10 minutes. Check back to stir and check on tomato. Cook the tomato down until most water has evaporated, the tomato is thick, and the oil begins to separate from the tomato. 4. Add the potato to the pan. Add turmeric, chili powder, and asafetida. Stir to combine all ingredients. It will take a bit of stirring to get all of the tomato mixture on all of the potatoes. Don’t worry if some of your potatoes are mashing and breaking down. This is a sabzi meant for spreading, so it’s okay if some break down and some are left chunky. 5. 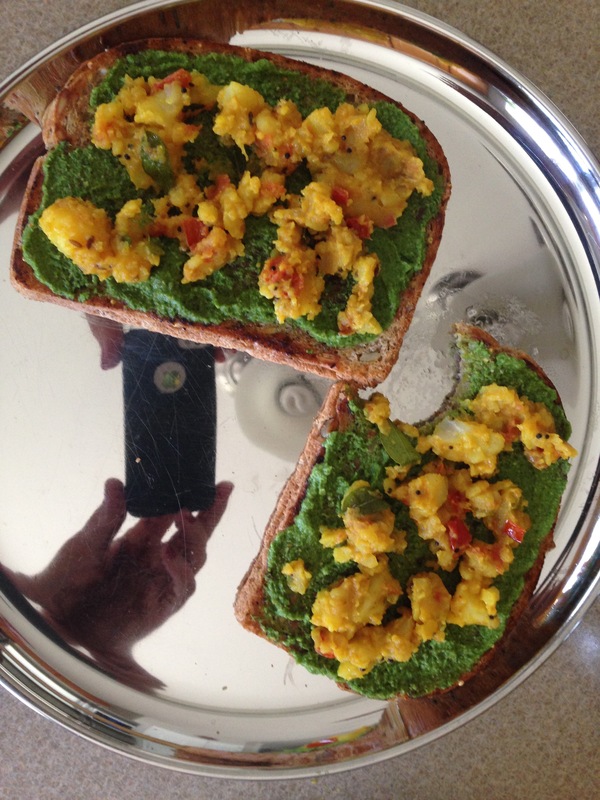 Remove pan from heat and top with cilantro. 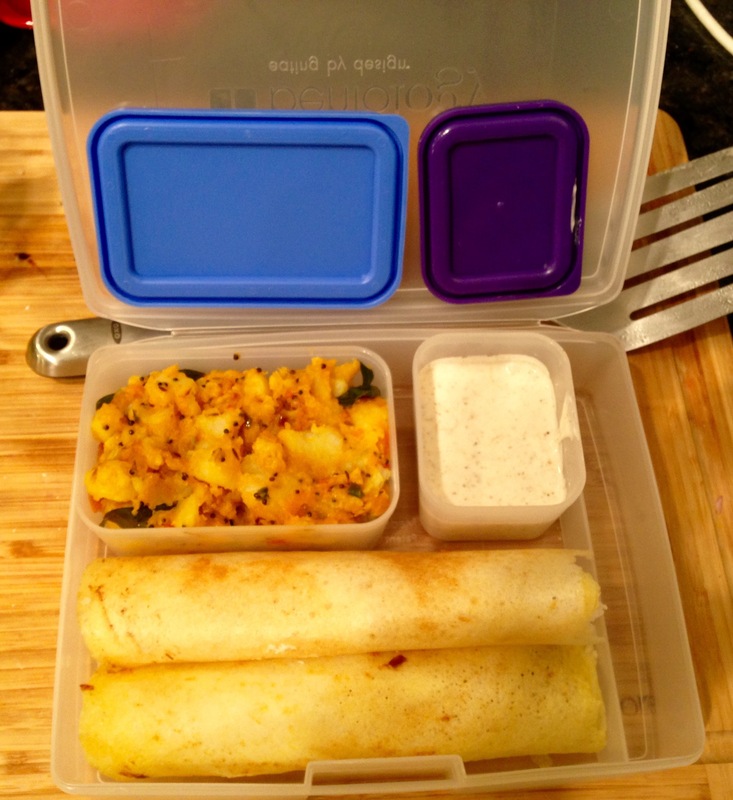 Serve warm in dosas, on sandwiches with cilantro chutney or with rice. Thanks so much! I will definitely have to try the Akhni. It looks awesome!